In addition to every other event under the sun, Vienna of Roslyn is no stranger to hosting Sweet 16 celebrations. That’s why we know a thing or two about how these parties are planned and decorated. Therefore, if you’re struggling with ideas, here are some essential Sweet 16 decorating tips. After all, this is an important event in the life of a young girl, so you want to make it count! Although Vienna will be by your side at every step of the way, it’s important to have a general idea of what you want the party room to look like. Since it’s likely the first thing guests will notice when they enter, it sets the tone for the evening. From the entrance and walls to the floor and ceiling, there are many important details to pay attention to. However, you won’t go anywhere without picking out a theme. The Sweet 16 theme will essentially dictate what the rest of the party will look like. Our next Sweet 16 decorating tip concerns the tables. First of all, it’s key that your party theme is incorporated in the table design. 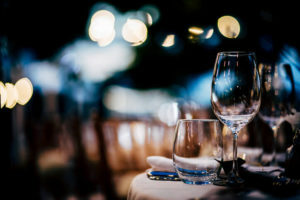 You can use plates, glasses, napkins, candles and the table cloth to reflect the theme. Many Sweet 16s also provide a bunch of giveaways on the tables like glow sticks, necklaces, masks and more. In addition to photo-ops, these fun props also help guests embrace the party atmosphere and theme. Besides, everyone appreciates a fun little gift they can take home with them. Best of all, it will help them remember your party for years to come. Most Sweet 16’s and parties of this nature will have a table where guests can leave their gifts so they don’t have to carry them around all evening. Decorations on the gift tables can be as simple as what you use on the other tables, or you can give it its own unique design. You can also consider adding small lights, flowers and even photos of the girl of honor. Don’t forget to include a small basket for gift cards and envelopes as well. 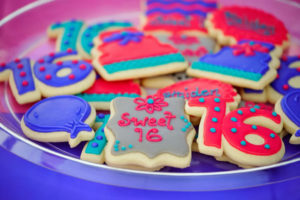 By utilizing these Sweet 16 decorating tips, you’ll be on your way to hosting a one-of-a-kind celebration that everyone will enjoy!